As summer winds into autumn, I begin to be lulled into a false sense of satisfaction, as crisp nights cause me to begin to dream of sweaters and boots and cooking hearty meals in the kitchen. Then, BAM!, the hot days come back with a vengeance, a t-shirt feels like too much clothing, and there’s no way I’m turning the oven on after all. Happens every year. You’d think I’d learn. Despite the heat wave, my body has decided it’s pasta time, remembering the chilly mornings before the 100 degree F days. I thought I’d compromise with my cravings by making a cold pasta salad, something assembled, the only heat required being boiled water. I paired dinner with a Red Meritage, enjoying the play of flavors with the different salad ingredients. Put a large pot of water over high heat. Cook pasta to package directions. While pasta is cooking, put mushrooms in a large bowl and drizzle a bit of vinaigrette over them. Toss mushrooms until they’re fully coated. 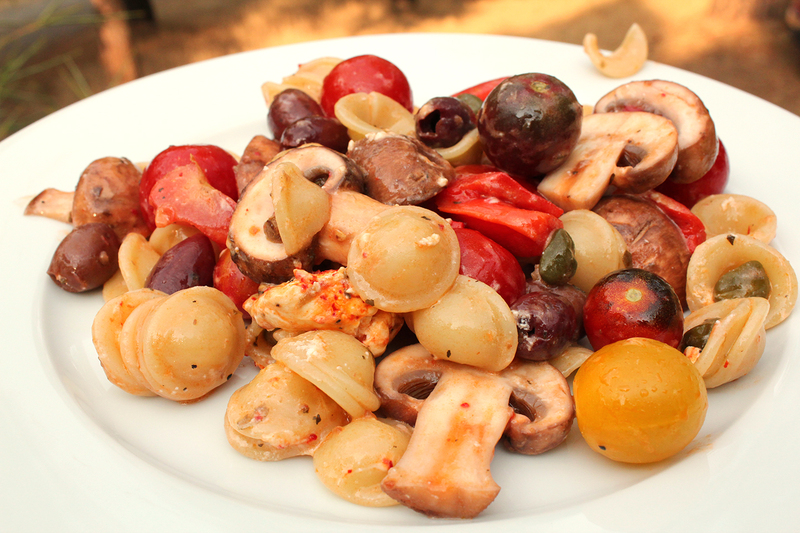 Toss roasted peppers, olives, capers, and sliced tomato into the bowl, mix well, and set aside. This will give the mushrooms a chance to soak in the flavors of everything else hanging out with it. Once pasta is finished, drain and rinse with cold water until the pasta is cool. Work the pasta through your fingers a bit, since conchiglie likes to nest into clumps. Add cooled pasta, cherry tomatoes, and goat cheese to the bowl with the rest of the ingredients. Drizzle on a bit more vinaigrette and toss until everything is happily mingled. You can serve right away, or cover it and leave it in the fridge until the next day, as it will be even more flavorful after a night’s rest.